What is ‘The School of Uncovering the Voice’? The simple answer: It was founded in 1924 by the Swedish singer, Mrs. Valborg Werbeck Svardstrom in collaboration with Rudolf Steiner. Mrs. Werbeck wrote her experiences and spiritual understanding of the human voice in her book, “Uncovering the Voice, The Cleansing Power of Song”. She composed hundreds of singing exercises which were carried to the next generation by Jürgen Schriefer. 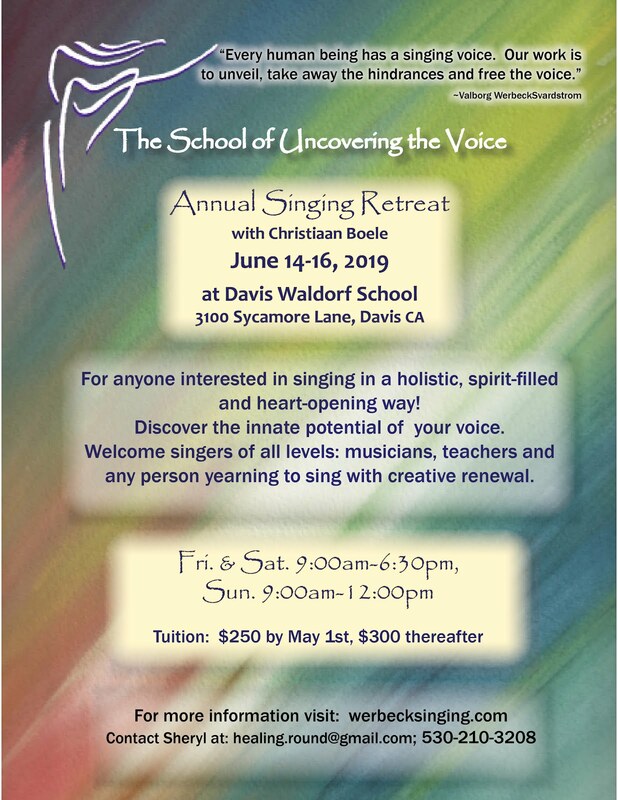 It is a holistic approach to singing that is in the early stages of being known in our time and Werbeck’s singing exercises are taught in some Waldorf teacher trainings. Every human’s voice and life story is as unique as their fingerprints. It is my hope that by reading the narrative of one person’s journey with Werbeck singing, some of you might become inspired to explore the possibilities for yourself. And so I offer you a glimpse into my involvement with this work as I have gone through the process, from novice to teacher. In 2001, I spent time with my friend at the American Eurythmy School in Weed, CA. I asked her, “Is there a spiritual approach that utilizes the voice in such a way as Eurythmy does with movement?” Her answer was, yes in fact there was, and I was invited to a weekend singing course with a visiting teacher, Christiaan Boele. So, in a pre-cell phone era, on a Friday evening, I embarked alone for a long drive from the Humboldt coast (where I was a student teacher), through the Shasta-Trinity National Forest, eager to attend my first anthroposophical singing class. As my old Buick turned the blind corner of a windy road on the edge of a dark mountain, it violently collided into a huge boulder, surrounded by rubble from a fresh rockslide. The tire and its rim were instantly wrecked, yet somehow I was able to propel the car forward and safely off of the pavement; thudding tragically down a dirt road that appeared out of nowhere in the wilderness, bouncing to a dusty halt in front of one lone house. There I met amazing, angel-helper- humans who were able to jerry-rig the Buick’s spare donut tire onto my car and send me on my way for the remaining two hour drive to Mt. Shasta. After almost not making it there at all, the next morning I attended my first Uncovering the Voice workshop. My perception of what it means to emanate song as a human being; of the potential of creating music with a group of other humans; and even my understanding of the very nature of sound in our world- all was unequivocally changed. We entered into the realm of pure cosmic tones and were led there through a process that contained holiness, sensibility and humor. It was indeed a spiritual awakening, yet simultaneously compounded with a deep yearning and sadness. The weekend course seemed as a moment ‘out of time’; an experience that couldn’t possibly be re-created in the everyday world. I felt privy to a mystery school; as if I had been invited to share in a rare teaching that was only known among the Eurythmists and other esoteric-type folks. The magical weekend ended and I returned to ‘the real world’. I managed to get on Christiaan Boele’s email list and periodically received invitations for lessons and courses that were offered in CA each Feb. and June. At that time, the 2nd Foundational Singing Training was beginning but life circumstances prevented me from signing up. 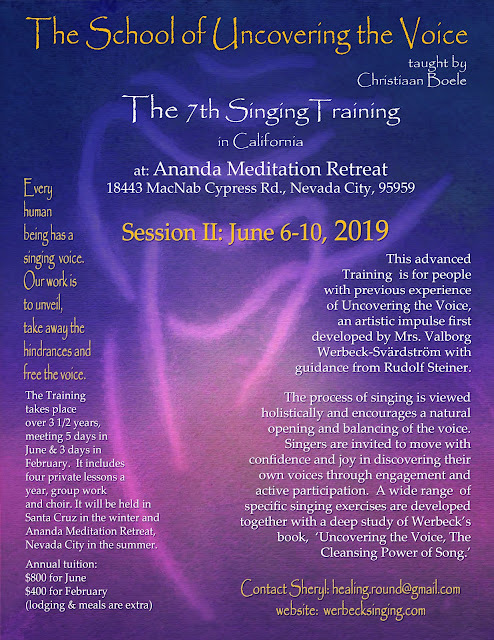 There was also a Therapeutic Werbeck Singing Training being offered in the US by another teacher, but I was advised to master the foundational understanding of Uncovering the Voice before learning the therapeutic applications. Over the next seven years, I attended the Open Course (now called the Annual Singing Retreat), had private singing lessons and went to Werbeck singing workshops at Waldorf conferences. I wrote down every Werbeck singing exercise that I learned and kept them alive by sharing them with my Waldorf students and colleagues. In 2008, at long last, I enrolled in the 4th Foundational Singing Training and my in-depth study of Uncovering the Voice truly began. What had once seemed to me as a rare and obscure singing occurrence became familiar and attainable. With the masterful guidance of Christiaan Boele’s instruction, I gained a spiritual understanding of the process of singing and the Werbeck exercises worked their magic of opening, clearing, balancing and strengthening my instrument. After completion of the 3 ½ year Foundational Training, I enrolled in the Pedagogical Training and learned how to become a teacher of Uncovering the Voice. In 2013, after demonstrating my teaching abilities, I earned my teacher certification in Uncovering the Voice, and I am now bringing the work further into the world in my own unique way. Singing is a lifetime of endless growth and possibilities and I continue to take lessons and advanced graduate courses with Mr. Boele. For the past seven years I have served in an administrative capacity for The School of Uncovering the Voice and have thus witnessed the transformational process that people have undergone as they’ve immersed themselves in Werbeck Singing. I have seen advanced, classically-trained, professional singers burst into heart-wrenching tears, wishing that they had found this singing school decades earlier; feeling that at last they were singing in their own authentic voice. I have also seen people with severely compromised singing abilities undergo a healing process; they are uplifted with confidence, joy and knowledge that they are able to discover their vibrant and beautiful singing voices. In these courses, all levels of singers become as equals, learning and transforming together. This process will meet you where you are at. The School of Uncovering the Voice is a flame of hope for the potential of our relationship to our individual voices, to each other as we unite in song and in our connection to the song of life itself. With each person that embodies this work, it continues to evolve in creative and artistic applications. In the United States, there are now approximately one hundred graduates of the Foundational Singing Trainings and there are a small handful of people who have earned teaching certificates from Christiaan Boele. A new Pedagogical Training has just begun and hopefully more teachers will be emerging in the coming years. The 6th Foundational Singing Training in CA will begin this June. May the work of Valborg Werbeck Svardstrom continue to blossom in our communities and shine into future generations. May all people be able to sing with well-being, liberation and beauty. - Attend the Annual Singing Retreat for a thorough introduction to Uncovering the Voice. - Join the 6th Foundational Singing Training in CA. This is the in-depth Training of Werbeck’s work and is in conjunction with private singing lessons. - After completion of the Foundational Singing Training, graduates are eligible to enroll in the Pedagogical Training and also advanced classes.